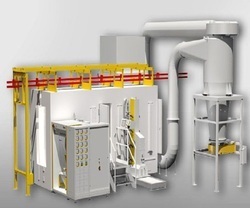 We provide an Conveyorised Powder Coating Plant for phosphating painting/powder coating and drying operations with internationally reputed paint spray applicators for continuous production.This Conveyorised Powder Coating Plant is made by quality approved materials that is purchase from leading vendors of the market. We also check these products on various quality parameters. The flexible layout of the Magic Plus Quick Color Change system makes it easy to integrate the system in different plant configurations. Two slots in the booth floor create perfect coating conditions up to 32'000 m3/h exhaust air. In steel booth Color change time is approx 40 minutes and in plastic booth color changing time is approx 20 minutes.